It sounds a little sci-fi, but this world-first technology, which knows whether a door or window has been opened in your child’s room, is already here. This wire-free device from VTech has the ability to monitor your home and your baby in a whole new way. Placing your tiny, newborn baby down to sleep is one of those confronting, new parent moments. They look so sweet, but so very small and vulnerable. Our instinct is to hover, watch over them and keep them safe. But that’s hard when life must go on as they slumber – and that’s where baby monitors come in. The VTech BM5000 Safe and Sound Audio Monitor with VSmart Wire-Free Home Monitoring is an innovative new offering from a brand we’ve grown to trust. In fact, VTech is SIDS and Kids’ exclusive baby monitor partner. Its baby monitors are designed with safety in mind – VTech has made sure that none of its monitor units need to be attached to a cot, so there’s less chance they will be a safety hazard to babies. VTech is incredibly excited about its new audio monitor, which allows you to hear your baby over a secure connection – and it also has a two-way talk back intercom, so you can soothe or chat to your child from another room. As another added peace-of-mind feature, the contact sensor can be placed on a door, cabinet or window, and you’ll get a visual and audio alert if these things open. So you’ll know if your baby (or anyone else) is into something they shouldn’t be! Motion sensors alert you if there is movement in your baby’s room, or around the home. Plus, the unit runs on batteries, and the wire-free sensors are a cinch to install. The VTech BM5000 Safe and Sound Audio Monitor with Wire-Free Home Monitoring is a simple and affordable system to keep tabs on and around your home when you have a baby. 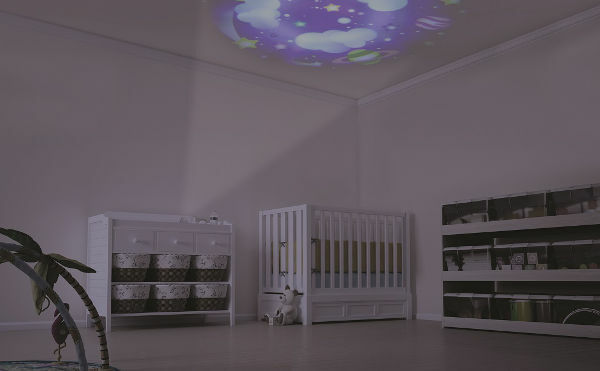 As a bonus, the baby unit has a glow-on-the-ceiling night light, which projects stars and the moon to gently lull baby to sleep, and the unit can also play a lullaby. The monitor comes with one contact sensor, and costs $149. 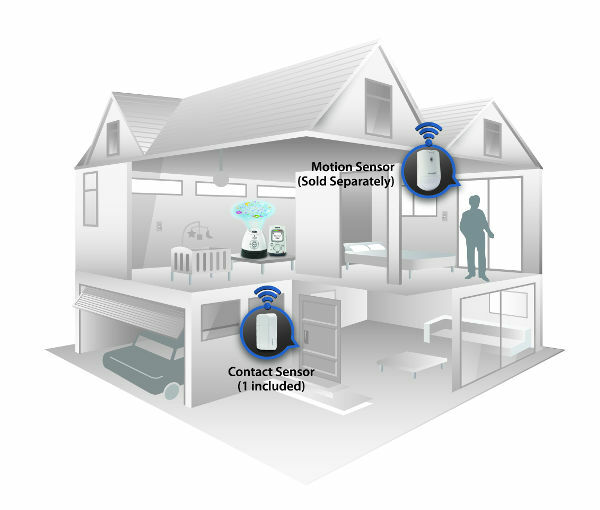 Additional contact sensors cost $50, while the VSmart Wire-Free Motion Sensor is sold separately for $75. You can purchase the monitor and accessories at Babies R Us.